Replies: 62 (Who? ), Viewed: 60102 times. #1 6th Aug 2005 at 3:36 PM Last edited by leefish : 17th Jan 2014 at 7:42 PM. DISCLAIMERThis is NOT a tutorial; it is intended to help average-experienced object creators performing specific tasks, or to give users a deeper in-sight on specific modding-related subjects. So, don't expect to find step-by-step explanations, to be performed "blindly". Please DO NOT REPOST the following info, or part of them, on other sites. 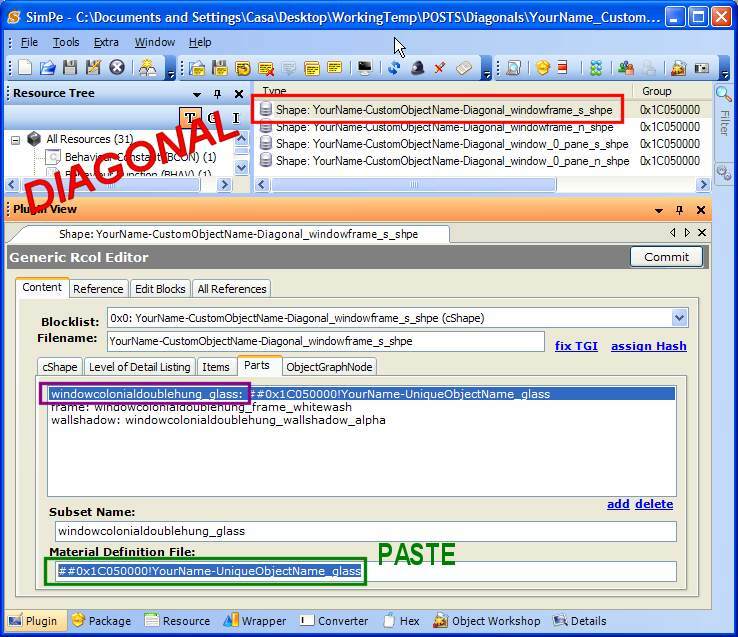 This article explains how to "link" straight and diagonal objects. It applies mainly to windows, doors, arches and curtains, i.e. the object types that Maxis has set to have a diagonal version. There's no apparent reason why this "linkage" shouldn't work for other object types, although this possibility is untested, yet. This InfoCenter article is also provided in PDF format. To view it, we strongly suggest to download the Foxisoft PFD Viewer: it's free and small, less than 1Mb! Start SimPE's Object Workshop and "Start" it by clicking on the proper button. 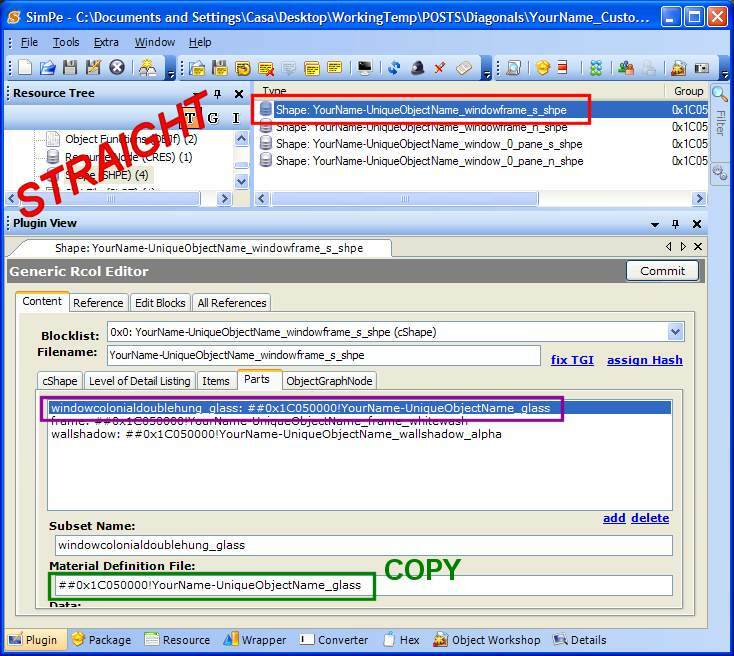 When the category list appears, browse it until you find the object (window, door, arch or curtain) you want to clone. In the list, you should find two almost identical entries, usually having the same name. The "straight" version is the one that has a thumbnail. 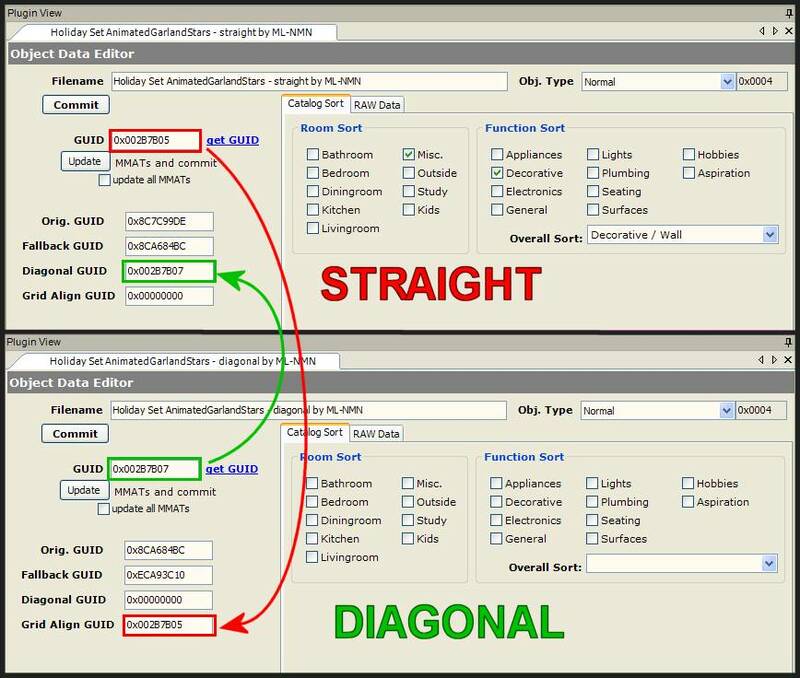 If you can't find, immediately above or below the straight object, another identical entry without the thumbnail, than be warned: maybe the object you have chosen was not designed by Maxis to have a diagonal version. Select the straight object and clone it. Leave all the cloning options as they are by default. HINT: in the Scenegraph rename Wizard, replace the suggested ModelName to a shorter, but unique, custom one; we suggest the form "YourName-UniqueObjectName". You can include dashes ("-") but NOT underscores ("_"). FAQ: Always leave the "Pull Wallmasks" option activated: even if the object you are cloning has no wallmasks (e.g. curtains), keeping the option checked won't hurt. Click "OK" in the Scenegraph window and save your package with a custom name; append the extension "_Straight" to the package name. When done, "Start Over" Object Workshop, select the diagonal object and clone it. Again, don't change the default cloning options. In particular, be sure that the option "Create as stand-alone object" is NOT checked. HINT: in the Scenegraph rename Wizard, replace the suggested ModelName with the same name you have used for the straigh object, but append to it "-Diagonal". Click "OK" in the Scenegraph window and save your package with the same name as the straight one, but this time append the extension "_Diagonal" to the package name. FAQ: it's not possible to include both straight and diagonal versions into a single package. 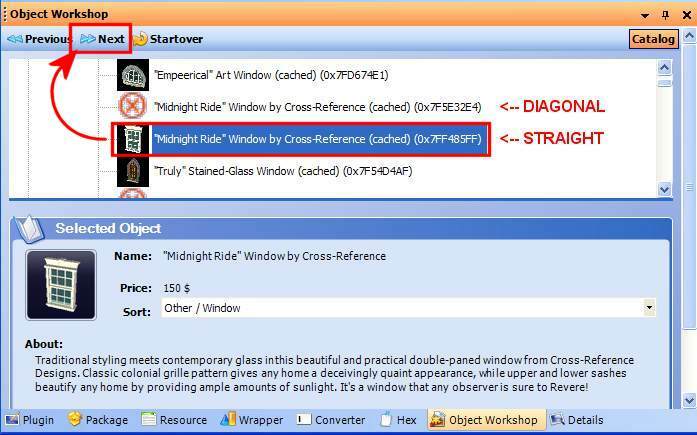 FAQ: the diagonal windows are listed in Object Workshop in "Other -> Windows", along with the straight windows; on the contrary, the diagonal curtains are listed in Object Workshop under "Unknown"
STEP 2 - EDIT THE MESHES AND THE TEXTURES. This step will not be explained in detail: the users are supposed to know how to do that (if not, please try and master the cloning and editing tecniques by following a good tutorial, like this one). Remember to register a unique GUID for each Object Data contained in both the straight and the diagonal packages. HINT: Diagonal windows, doors and arches usually use the same mesh as the straight version, so you don't have to edit the diagonal mesh: you can simply import the straight one in the diagonal, too. On the contrary, diagonal curtains and drapes usually have a different mesh than the straight one (it is turned by 45° and moved off-center, compared to the straight one). 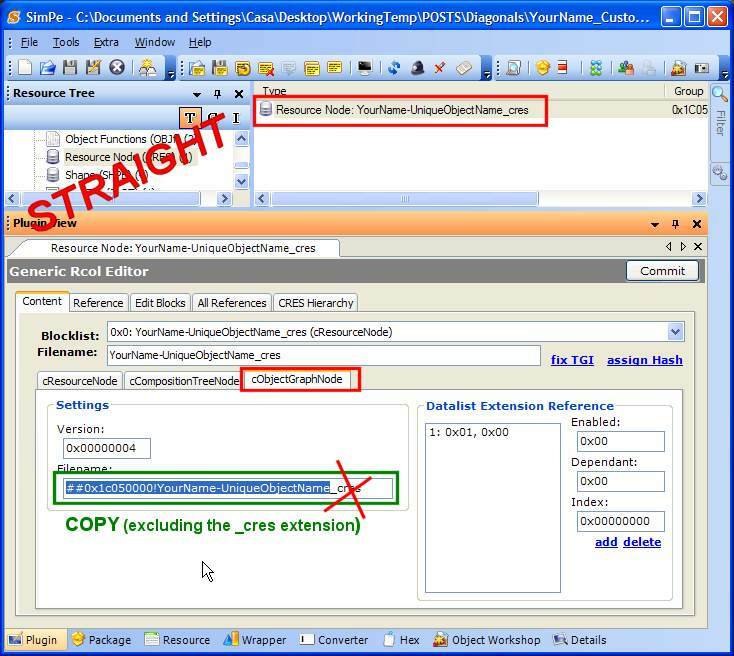 STEP 3 - LINKING THE OBJD (Object Data). If we want our object to automatically turn by 45° when placed on a diagonal wall, we have to "link" the straight OBJD to the diagonal OBJD. To do so, we have to put the GUID of the "master" straight OBJD in the "master" diagonal OBJD. If the objects you have cloned have only one OBJD, that is the "Master" one. But very often there are multiple OBJDs in the same package, you have to understand which one is the "Master". The only safe system to be 100% sure to locate the correct "master" OBJD is looking into the "Raw Data" tab of the OBJD, in the fields 0x000B ("Multi-tile sub index": it's under the "Placement" section): if you find the value "0xffff", that is the "Master" OBJD. FAQ: Sometimes (luckily, very seldom), all the OBJD in the package have the same name: in this case there's no other solution but looking at the field 0x000B, as explained above. You have to copy exactly the values as shown in the picture: the main GUID of the straight object sould be copied into the "Grid-Aligned Selector GUID" fields of the diagonal; and the main GUID of the diagonal should be copied into the "Diagonal Selector GUID" fields of the straight. HINT: Opening the two packages in two different instances of SimPE running at the same time will simplify the job. You may have noticed that in the diagonal clone there are no textures (though sometimes a "shadow" texture is included) and no Material Overrides. This is normal: in fact, the clone will "borrow" the textures from the straight version; we only need to "tell" the diagonal where to find the needed textures. We do this by copying all the MATD references contained in all the straight Shapes in the corresponding diagonal shapes. Windows, doors and arches have multiple shapes (the diagonals have the same number of Shapes, with similar names). Curtains are simpler, because usually have only one shape. Select the first Shape, go to the "Parts" tab and select the first line; copy the Material Definition reference and paste it in the same line of the same shape of the diagonal. When you copy and paste the Material Definition references, include the ##0x1C050000! part. Repeat the Copy & Paste for each line of the Shape, and for each Shape. The last thing to do is to modify the diagonal GMND, in order to instruct it to look for the texture in an external packages. Open the straight package and select the Resource Node; go to the "cObjectGraphNode" tab. Copy the the CRES name, including the ##0x1C050000! prefix. 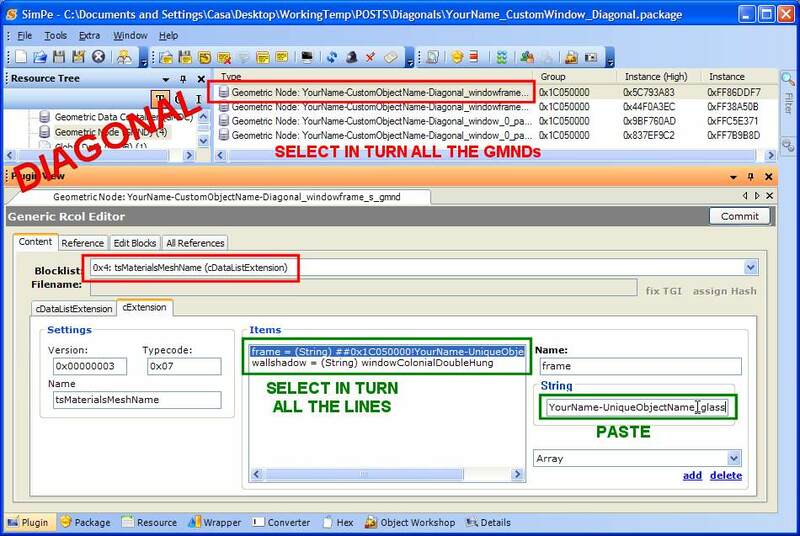 Now open the diagonal package and select the GMND; from the Blocklist, choose the "tsMaterialsMeshName" block. Select in turn each line of the Items list and paste the CRES reference into the "String" field. Commit each time. Thank You!! I truly appreciate all the knowledge that you share with us. This is very useful information and seems easy to follow - I have added it to my list of things to try next. With all the information you and JWoods have been providing, we should all be experts in no time !! Thank You!! the main GUID of the straight object sould be copied into the "Diagonal Selector GUID" fields of the diagonal; and the main GUID of the diagonal should be copied into the "Grid-Aligned Selector GUID" fields of the straight. There is a little mistake there in the text, even though the image shows it correctly: You have to copy the main GUID of the straight object in the grid-aligned GUID fields of the diagonal version, and the main GUID of the diagonal should be copied into the diagonal GUID fields of the straight one . IgnorantBliss: Thanks, good eyes It has been edited. I would like to add a bit of extra information that I think I figured out while cloning an archway. If you have a slave object, like an archway, that borrows its textures from a "master" object, like a door, to make the diagonal version of the slave object work, you have to link its shapes and textures to the master object, but the GUIDs to the straight version of the slave object. Thank you everyone for this information. But I´ve got a tiny little question. I made new curtains from the Trower Mac Close Curtains and they work fine, but when I recolor the straight version the diagonal version remains as it is. Do I have to alter the diagonal package to get this work or did I simply went wrong somewhere down this tutorial and everything should work fine when simply recoloring the straight package? Seems that you made a mistake performing 5: double check if the values in the txMaterialsMeshName block, in the diagonal GMND, match the CRES name of the straight. Thanks a lot for your reply, Numenor. I now found the mistake, but I don´t know how to fix it. In the GMND, there is no tsMaterialsMeshName block (I acidentally changed another block without noticing I got the wrong name). Can I fix this or does this mean that I cannot use the TrowerMcCloseCurtains as a basic object? you need to create a new one, look at the repository tutorial. What are those curtains? Maxis ones? Because I can't find them anywhere. Apart from fixing the current file, you could just make a new clone of the diagonal version. They are Maxis ones. I am playing the German Version so the name may not be right. I think making a new clone will not help, because the tsMaterialsMeshName block was missing from the beginning. I did not delete it. Seems to be a strange curtain, as it also contains a texture for the diagonal version. Anyway, I wanted to use this one because it has two seperately recolorable groups and a texture where certain areas can be left completely blank. I need these features for my new mesh. I´ll try and see if a can find another one with similar features. Just making sure in case you didn't notice that it's just the diagonal version that needs the tsMaterialsMeshName, not the straight version. #17 4th Dec 2005 at 8:35 PM Last edited by bienchen83 : 4th Dec 2005 at 8:58 PM. I know, but thanks for trying. I double checked that I cloned the right version. According to the file name (curtainvaluediagonal-[bienchen83-3.12.2005-c832]_root_rot_gmdc), this should be the diagonal version, but still it looks to me like a quite independent Mesh. EDIT: I seem to have found the only curtain with independant straight and diagonal versions. Lucky me. Nevertheless, I now found another curtain with the desired features which contains all the blocks needed. So I´ll just go and make two new packages. Thanks for your help, IgnorantBliss. By the way, you are the webmistress of Pixel Sims? I love your site! Good luck with your curtain! I would check the curtain but I don't know what it's called in the English version. Glad to hear you like my website . I had no problems using the other curtain as basic object. It works perfectly now. Thanks a lot for this great "tutorial" and the support I got. I chacked the curtain-value: yes, the diagonal definitely is stand-alone... Very strange. It was not included in the CEP, either, because I was unaware of this problem. I should fix it in the next CEP release. bienchen, i mean create a new tsmaterialsmeshname. it's easy if you follow the repository guide. Thanks, Fat D. I might find this useful for one of my next meshes. Numenor, thanks for your response. Apparently I have a hand for encountering strange problems. This message has been deleted by sims2germany. #23 4th Apr 2006 at 4:54 AM Last edited by simnuts101 : 4th Apr 2006 at 5:24 AM. I am now trying a two tile door (VIP door). I have made the straight version, and that works beautifuly in the game, it's the diagonal mesh that I just can't seem to get to work. I have tried linking the straight door with the diagonal one quite a few times, but in the game I keep getting that it cannot be placed on a diagonal wall. I'm not sure why, I have gone through the tutorial about 5 times with no luck. Now I'm not sure if doors are a bit different than windows as I notice when you pick a diagonal window to clone, the value is $1, but for all the doors, I have noticed that the value is the same for both diagonal and straight. I have attached the files below for you if you do have a second to look at them. The diagonal mesh is the test one right now, the other is the straight one. EDIT Sorry Numenor, I just realized that I was using the wrong file!!!! :insane: Working with two different ones, I guess I should make sure I've got the right one!!! Sorry again!! I dont' know if I'm having the same curtain issue as Bienchen - my diagonal isn't working, its not reverting, its just not working. Its the veil of dreams curtain, the diagonal did include a mesh and textures - is that what is meant by standalone? I followed the diagonal linkage tutorial (something I am a bit wobbly with but have usually suceeded at the past with the small number of doors and windows I've attempted). The curtain is flumoxing me, but I thought since this was mentioned that perhaps if there is an issue with the diagonal that prevents the above tut from working, then it may not be my stupidity after all. With that in mind I'd be grateful if some bright person could check over the attached and see if there's a spankingly obvious problem which I'm just not seeing! hi, I've done this tutorial a few times over, and over and over lol. Its doesnt seem to work for me. At first the diagonal window would revert back to the origional, but now its saying "can not be placed on a diagonal wall"
Can some one help, take a look at the package and find out what I am doing wrong...my head hurts lol.